A NASA spacecraftdestined to crash into a moon crater in the hunt for hidden caches of water icehas a new target, the space agency announced Monday. Thedecision means that NASA?s LCROSS probe and its spent Centaur rocket stage will now crashinto the large crater Cabeus, and not the nearby (and smaller) Cabeus A crater previouslytargeted, when they slaminto the moon on Oct. 9. Scientistspulled the lunarswitcheroo based on a continuing analysis of data from recent moon-watchingspacecraft. The data suggests the new target Cabeus has the highestconcentration of hydrogen - an indication of possible water ice - than anywhereelse at the lunar south pole. ?The LCROSSteam concluded that Cabeus provided the best chance for meeting its missiongoals,? mission managers said in a statement. The newscomes less than a week after scientists announced the discoveryof water on the moon in the form of water molecules bound to the lunar dirt. Cabeus is alarge crater about 60 miles (98 km) in diameter that sits at 84.9 degreessouth, 35.5 degrees west at the moon?s south pole. It has two nearby satellitecraters: the 25-mile (40-km) wide Cabeus A - LCROSS? original target - and CabeusB, which is about 38 miles (61 km) in diameter. A smallvalley etched into the otherwise tall crater ridge of Cabeus should allow sunlightto shine on the ejecta cloud kicked up when LCROSS and its Centaur rocket stagecrash into the moon in successive impacts. The shadow of a large hill along theridge should provide enough contrast for Earth-based measurements of the plume?scomposition, NASA officials added. 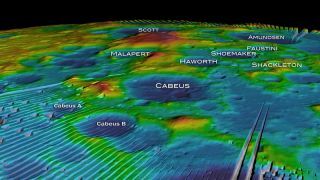 ?During thelast days of the mission, the LCROSS team will continue to refine the exactpoint of impact within Cabeus crater to avoid rough spots, and to maximizesolar illumination of the debris plume and Earth observations,? NASA officialssaid. NASA?sLCROSS probe - officially known as the Lunar Crater Observation and Sensing Satellite- is actually a pair of vehicles headed for what maybe one of the most watchedcosmic collisions in history. The mission is aimed at the permanently shadowed craters of the moon, where scientists think water ice may exist untouched by the sun's rays. The $79million mission launched in June along with NASA?s powerful LunarReconnaissance Orbiter as part of the agency?s first new missions to explorethe moon. Finding usable water ice on the moon would be a boon for futuremanned missions to the lunar south pole since it could be used as a resource tosupply astronauts with drinking water, or be split into oxygen and hydrogen to createrocket fuel. LCROSS andits spent Centaur rocket stage have been making sweeping orbits around theEarth as they fly ever-closerto impact day. The Centaur stage will crash into the target first, withLCROSS expected to fly through the resulting debris cloud before meeting itsown demise a few minutes later. Data beamedto Earth from LCROSS during the two impacts, as well as observations from aflotilla of spacecraft and telescopes on Earth and in space, will be recordedto determine whether the two vehicles kick up any water ice among the ejectafrom their successive crashes. LCROSSscientists have dedicated their mission to the memory of the late CBS anchormanWalter Cronkite. New Video - Why Bomb the Moon?